“We should give importance to spiritualism in our education and religious discourse as our world is increasingly becoming too materialistic. We should also emulate the Prophet's (peace be upon him) character. He was a man of utmost humility and truthfulness,” he said. Speaking to Arab News, Kutty said the curricula followed by most Muslim educational institutions have failed to mold the character of students in accordance with the Prophet’s teachings. “Our curricula should have fiqh (jurisprudence), aqeeda (faith), akhlaq (moral values) and tasawwuf/ihsan (spirituality) content. 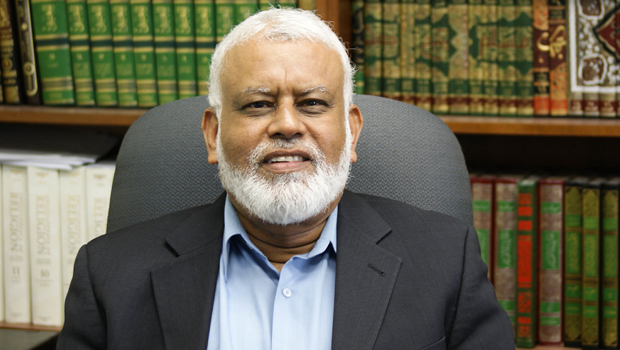 Our educational institutions should also teach students the importance of protecting the environment,” said Kutty, who has been listed among the 500 most influential Muslims in the world by an American research group. Kutty, who was in the Kingdom with his wife Zuhra to perform Umrah, explained how Prophet Muhammad (peace be upon him) transformed Madinah into a clean city. “Removing litter from the street is one of the charities taught by the Prophet. Several wells were constructed in Madinah during his period to provide clean water,” he said, while talking about Islamic teachings on environment. According to him, spiritual bankruptcy is the main factor that encouraged many Westerners to embrace Islam. “Despair and anxiety forced them to search for truth and they found solace in Islam, which is a complete way of life,” he said. “Islam is the fastest growing religion in the West today,” he said. The Canadian scholar believes that the best way to propagate Islam among the non-Muslims is to win their trust. “Be a good friend and a good neighbor. I have a Christian neighbor. He cuts my grass and I cut his. We help each other in many ways. I did not talk to him about Islam but he sees what Islam is through my actions. He invited me to his church to give a lecture on Islam. We have to build our credibility. Preach through your own examples and practice. Let them see your action. This is the only way we can propagate Islam among the Westerners and other people,” he pointed out. Shaikh Kutty urged Muslims to be more open to criticism. “The biggest problem with we, Muslims, is that we are too emotional in our approach. We are not ready to accept criticisms. We think if somebody attacks Islam it'll crumble. We should be more proactive toward criticisms and use them as an opportunity to communicate with others and remove their misunderstandings. Believe me, nobody can defeat or destroy Islam,” he said. Kutty is an ardent advocate of Muslim women’s empowerment, which according to him is essential for the development of the Muslim community. “We can talk for thousands of years that Islam is this and Islam is that, but people will not accept Islam until we change ourselves according to its teachings,” he pointed out.